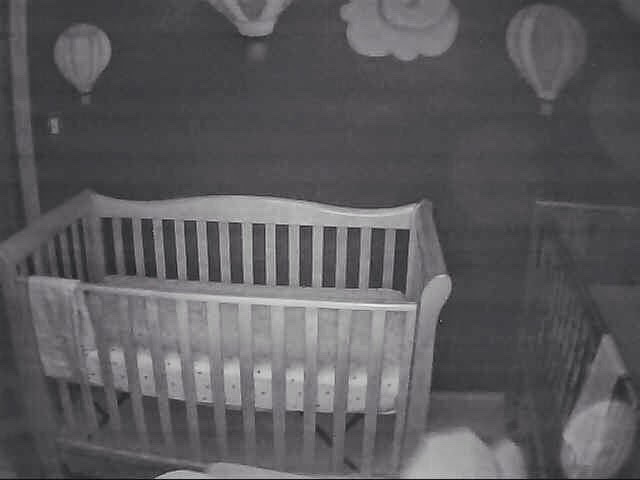 This is what the night-vision image from the expensive webcam baby monitor I bought the other day. We tried using a Dlink webcam which has an app for watching on your mobile devices. Unfortunately, it only remains active for a couple of minutes before timing out by design. So I opted for the more expensive BabyPing Webcam that has support specifically for i-Devices, of which our family heavily relies on. First, it does not recognize my wireless network. In fact, unlike many devices out there, it doesn't even scan to see what available networks exist. You can get around this by manually entering your wifi network SSID like some sort of caveman would. If that fails, you can use a wired connection. I have done so, using one of the NETGEAR Powerline Adapters . And this works fine for ME, especially since I would prefer a hardwired connection on something like this. [I suppose someone might argue it's not a true hardwired connection but let's not mince words.] However, many people only have their wireless signal coming from their modem/router and have no idea how to bring the connection across the house. Because, end user. Second, the app itself looks and feels like a baby monitor. I'd prefer it if it worked more like a simple web or surveillance camera as I'd like to re-purpose it for that once the kids are beyond the monitoring while they sleep age. We have about 25 more days left to evaluate this device if I want to return it and get my money back. I'm of the mindset that if it doesn't work for us, we need to do that. Otherwise, I just pissed away $200 that I could definitely use for other purposes.